Judy A. 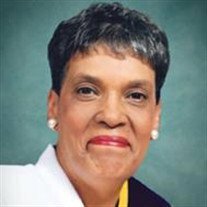 Wells, 76, of Owensboro, transitioned to eternal life on Tuesday, January 1, 2019 at Vanderbilt University Medical Center in Nashville, Tennessee. Judy was born in Princeton, Kentucky, on September 19, 1942 to the late Ellis and Katie Harmon. She was a graduate of Western High School and attended Kentucky State University. Judy was a member of the Tenth Street Missionary Baptist where she enjoyed serving others through the Matron’s Auxiliary. She also was a proud 29-year member and past Worthy Matron of the Order of Eastern Star Amaranth Chapter #46, Owensboro, Kentucky. Judy was retired from Western Kentucky Gas. She especially enjoyed playing the piano and listening to gospel music. Her favorites were traditional Christian hymns. She also liked to shop, decorate and spend precious time with her favorite girls. In addition to her parents, Judy also was preceded in death by her husband, Gerald Dean Wells and 2 sons, James “Robin” Dotstry and Gerald “Jay” Dean Wells, Jr.
Those left to cherish her memory include her daughters, Cheri Wells and Kim (Garrett) Humphrey, all of Nashville; a son, Paul “Flip” Wells of Central City; a sister, Charlotte (Luther) Johnson of Columbia, South Carolina; 8 grandchildren and 4 great grandchildren. The last rites will be given at 11:45 by the Order of Eastern Star Amaranth Chapter #46.